Lyle is a young man who hates his life in the State of Salt, a cultural and literal desert. He vandalizes a State icon, then swallows a poison pill that transports him not to death, but to a liminal realm—blue, watery, and wholly alien. 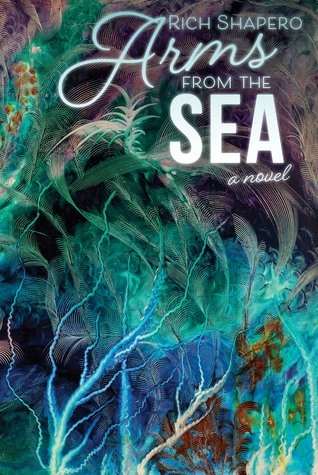 He’s rescued and shepherded by henchmen of the Polyp, god of the oceanic world they call “heaven.” A series of encounters unfolds between Lyle and the monstrous, seductive god, who gradually reveals his grandeur and mysterious purpose. Lyle is horrified at first but soon finds himself falling for the Polyp, and the potent and bizarre creative potential he represents. I have no idea what I’ve just read; it was like smoking a load of bad grass. This is a standard dystopian future story where the protagonist is a paragon rebel caught up in a fight to overthrow the malicious government. Although this is usually an excellent formula for excitement and adventure, Shapero manages to miss the bullseye entirely by jumbling his prose and baffling his readers. The plot is infernally foggy, with a tiring quantity of confusing imagery thrown in. It’s difficult to keep track of what’s going on - and what’s going on isn’t at all compelling, or even significant. The narrative slops along for a few pages at a time until something somewhat evocative happens, only for nothing to ever become fully realised. Lyle the protagonist is dull, with no real substance between his ears, making him incredibly difficult to connect with. His motivations and backstory are told, rather than shown, rendering any potential emotional connection null and void. There are various scenes where Lyle, after being whisked off to the water kingdom, has encounters with the Polyp, or water god. Many of these felt really creepy and sexual, as the god felt him up constantly with his tentacles, and whispered questionable things to Lyle. Think Robin Thicke with fins. An utterly baffling story whose plot I am at a loss to describe; I’m only glad it’s over.